People with pain and/or limited use of their hands will find using this Playing Card Holder much easier than trying to hold multiple cards in one hand. 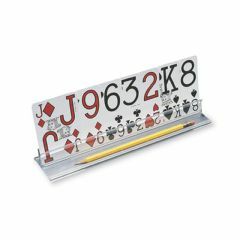 The slot on The Playing Card Holder is designed so that cards can be easily added or removed. The Playing Card Holder also holds Mah-Jongg tiles, recipes or memos. Pencils and small coins fit on the extended front of the card holder. The Playing Card Holder measures 2" Deep x 1 3/8" High. Available 10" or 15" Long. Package of 4 Playing Card Holders; Cards shown NOT included with the Card Holder. I use them to play cards with my grandchildren. Their minds are ready but their hands have a hard time holding more than a few cards. I've given many sets as gifts to other grandparents. A must have in my classroom. Holding small signs. Playing cards. Viewing Photos. Doing flash cards. Gives people with fine motor difficulties the ability to participate independently in card games and in other activities in which one needs to hold onto a card(s).